In only four years time, I’ve noted a remarkable change in Nepal, most interestingly in education. 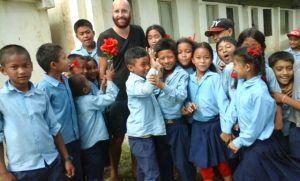 At the end of 2014, a public school where I was volunteering—in the village of Changu Narayan, nearby the city of Bhaktapur—was planning to expand from grade 7 to grade 8. But now, only four years later, the highest level is grade 5. The student numbers have halved, at least. According to a local friend, this is due to more and more parents being able to afford to send their children by school bus to private schools. More income has been generated—to some extent due to tourism and NGOs—and land has been sold. This trend is nationwide in Nepal: students in private schools are increasing whilst the public sector is decreasing. Poverty over all has decreased over the last few years. But whilst the people in the cities get less poor—and good for them!—villagers still struggle to keep up. I volunteered one year ago at the Shree Kalika Deurali public school, and I am back this year. There, going to a private school is not even an option. There are none in this rural area. And even if there were one, parents don’t have the money for enrolling a child in a private school. Most parents are farmers, harvesting just enough food to feed the family. Other jobs are scarce and local pay is very low. And if prices in cities increase, due to the above mentioned trend, it can become more complicated for villagers. The public schools in rural areas struggle, therefore, as well. It is difficult to get qualified teachers and educational material from the community. On top of that, the help from the government is limited. Luckily there are organisations like HELP who focus mainly on schools in rural areas. The rural Shree Kalika Deurali school has done well since HELP send volunteers. Students have developed more English and computer skills over the last several years. Now, I can have basic conversations with students, which was not the case before volunteers. Reading books have been donated, so the students are improving their reading skills as well. Also, the teachers listen to the suggestions of volunteers, like making classrooms a learning-friendly environment. Unlike most public schools, this school has expanded: from grade 8 to grade 9. Level 10 will follow. Funds for the two new classrooms were donated by the Belgium NGO, Himalayan projects. A local politician has arranged new roads between small villages and the school, and a medical centre is under construction. A school Facebook page has been made, and is full of information and photos and videos, resulting in donations. 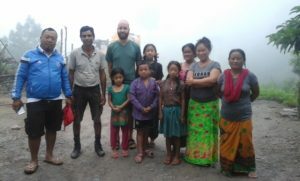 It is nice to see how the local community, social media, Himalayan Projects, and HELP are working together to improve this area. Everyone in Nepal deserves a better-educated future, not just the inhabitants in or near cities. In conclusion, it seems that the focus on rural areas—which HELP does—is even more important than four years ago.